A charity fundraising event to fight worldwide hunger returns to Austin for a third straight year. The annual Chicago-area CROP Walk celebrates its 34th year Sunday. This year’s five-mile route – and shorter three-mile alternative – begins and ends in Oak Park while traveling through Austin; Third Unitarian Church is among the rest stops. The event, sponsored by churches in Oak Park, River Forest and Forest Park, raises money for food pantries in the city and west suburbs. The CROP Walk dates back to the 1960s, when local congregations across the country began hosting walkathon fundraisers to fight hunger worldwide. The Chicago-area event has raised about $1.4 million since its inception, including roughly $72,000 last year. This year’s tally has already reached $27,000 from donors sponsoring a walker, with minimum donations starting at $25. “This just shows how one person can make an impact on hunger in just this one day commitment to walk,” said Martin Colchamiro, co-chair of Hunger Walkathon West, the event’s sponsor. The faith-based organization currently supports nine Chicago-area food pantries, including Austin’s Pine Avenue United Church. The Austin neighborhood was also included on the route in the event’s earlier years. With the route slightly changing every few years, Austin was included again in 2015, said Joanne Despotes, the event’s co-chair who’s been involved with the walk since the beginning. The CROP Walk is among the programs run by Church World Service, a network of U.S. denominations. The organization’s “Christian Oversees Rural Program” began in the 1940s to “feed the hungry and shelter the homeless,” according to its website. It has since evolved into the CROP Walk fundraiser. Church World Service’s receives the bulk of money raised for its anti-hunger programs with 25 percent going to local food pantries. 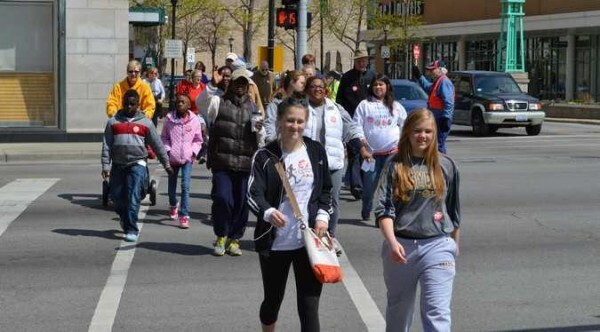 About $18,000 from last year’s Chicago walk went to local agencies. “We’re not just helping people locally, but we’re fighting hunger all over the world,” Despotes said.